Time to set your affairs in order, now that you have laid eyes upon these truly chilling wax figures of Harry and Meghan, Duke and Duchess of Sussex. Similar live waxworks were unveiled in a “world first” in London earlier this year, when visitors were offered the chance to “celebrate the wedding of the year all over again with their royal likenesses”. The pair made an appearance during Britain’s Got Talent live final and wore lookalike clothing as they walked around London as if they were the royal couple. People reported that “Princess Xenia von Sachsen – the great-great-granddaughter of the last king of Saxony, Friedrich August III – posed with the faux couple before they decorated a Christmas tree (much smaller, of course, than the one outside their current home of Kensington Palace), checked out presents and cradled Meghan’s stomach.” Unfortunately, we do not have a picture of the Princess. 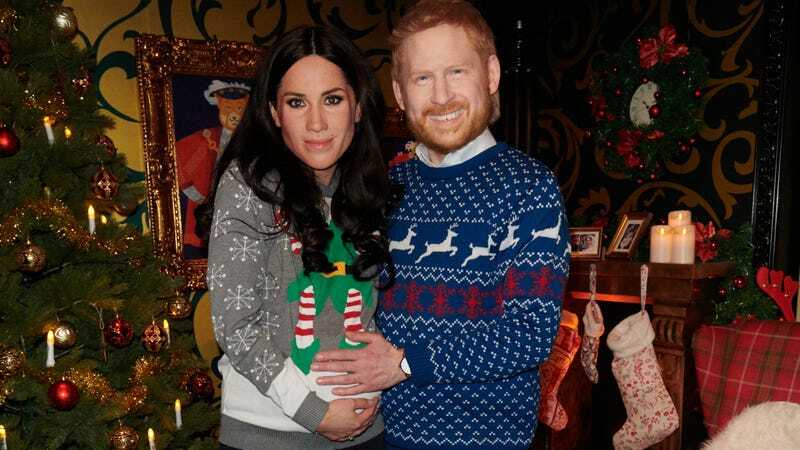 Instead you will have to settle for this picture of Wax Harry and Wax Meghan wandering a Berlin Christmas market, holding up a gingerbread heart, looking like a couple of RealDolls who’ve achieved sentience, found love, and escaped to build a beautiful life together. God bless us, every one! Speaking of Cheap, What’s Up With This Wax Figure of Meryl Streep?